Reading Viaduct Stockpile removal was a contract for the remediation of an area of land known as ‘The Triangle’ off Cow Lane in Reading. The site was historically a railway yard which was decommissioned as part of the ongoing redevelopment of Reading station. This development was termed the Reading Station Area Redevelopment or RSAR scheme, which included the construction of a number of overhead railway lines and the rerouting of the Great Western main line to facilitate the streamlining of railway operations through Reading. As part of this redevelopment scheme a large amount of excavation waste was generated and stockpiled in the area known as ‘The Triangle’, this stockpile of waste was left by the previous contractor following the completion of the viaduct project. J Mould (Reading) were approached by Network Rail to remediate this stockpile and the surrounding area back to existing levels. J Mould (Reading) were awarded the sub-contract by Carillion Rail who were acting as Principal Contractor to Network Rail for the project. The scheme, which was dubbed the ‘Reading Viaduct Stockpile Removal’ was to excavate, remediate, classify and remove off site a stockpile of 40,000 cubic metres of contaminated soils which were the arising’s of the RSAR project. Knowledge of the levels of contamination were vague, and relied on reports carried out by the previous contractor which were sparse and incomplete. J Mould (Reading) commissioned a full and extensive site investigation to establish the levels and locations of the contamination, which was targeted on areas of suspected contamination from the prior report, and gave a true cross section of where the contamination was and to what level. From this SI a comprehensive strategy for the selective excavation, onsite validation testing and subsequent removal to licenced facilities was drawn up. Licenced facilities were sourced for the 6 different categories of waste from site, namely inert recyclables, inert soils, non hazardous contaminated soils, non hazardous contaminated soils with low level asbestos, and hazardous soils impacted with hydrocarbons. An onsite testing facility and offsite laboratory links were set up in order to further classify the waste and confirm the findings of the SI as it was excavated. The stockpile was split into zones and each zone was excavated and removed separately with each zone being split into different levels and sectors with each sector and level being independently classified for offsite disposal before being loaded away from site. 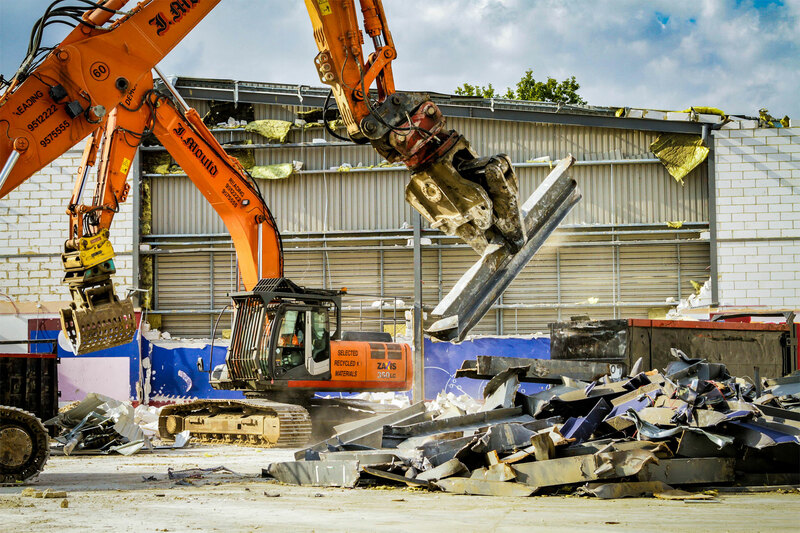 J Mould (Reading) mobilised 2 x 35 tonne 360 excavators to site, one to move material to the loading area once it had been classified, and another to load lorries. 25-30 lorries per day were sourced to move the stockpile in the required time frame, which necessitated removing over 60 loads per day. A one way system and wheelwash was established on site to ensure a smooth flow of the lorries removing material, and to minimise the impact on the surrounding area. The project was completed 2 weeks ahead of schedule.